The Cultural Palace was designed in 1930 by the architect Victor Smigelschi, and its purpose was to host cultural events. 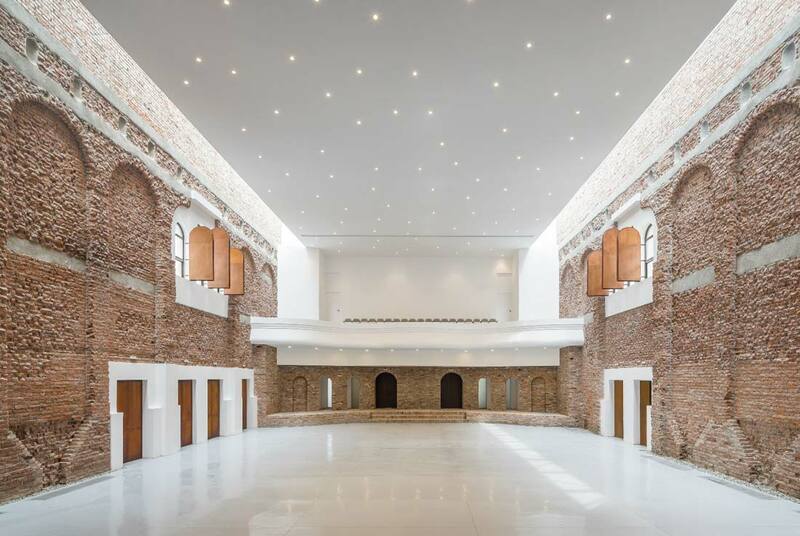 In 1995 a significant fire burnt down most of the building and it remained a ruin until 2012, when the municipality initiated a project for the regeneration of the building, with a new flexible multipurpose hall. The Cultural Palace is situated in the 1848 Square of the historic centre of the city of Blaj, located in the Historical Monuments National Protected Area. The building was always intended to be used primarily for cultural events initiated by the Transylvanian Association for Romanian Literature and Romanian People’s Culture. It operated as the auditorium of the city, and after 1969 as the city’s cinema. Since 1963, the upstairs rooms had accommodated the Museum of History and Ethnography and during the next six years, the town’s Library. All these functions had resulted in changes to the interior of the building. Unfortunately, in the winter of 1995 a large fire destroyed much of the building. In 2012 the city administration of Blaj initiated a project for the rehabilitation and refunctionalisation of the Palace, which had been standing as a ruin for 17 years. Their purpose was to restore the building to current standards. It was determined that a new main hall be adopted to meet the actual cultural needs of the community. The building would be redesigned to incorporate a flexible multipurpose hall, which could be lit both artificially and by daylight, and which could host a wide variety of cultural events. 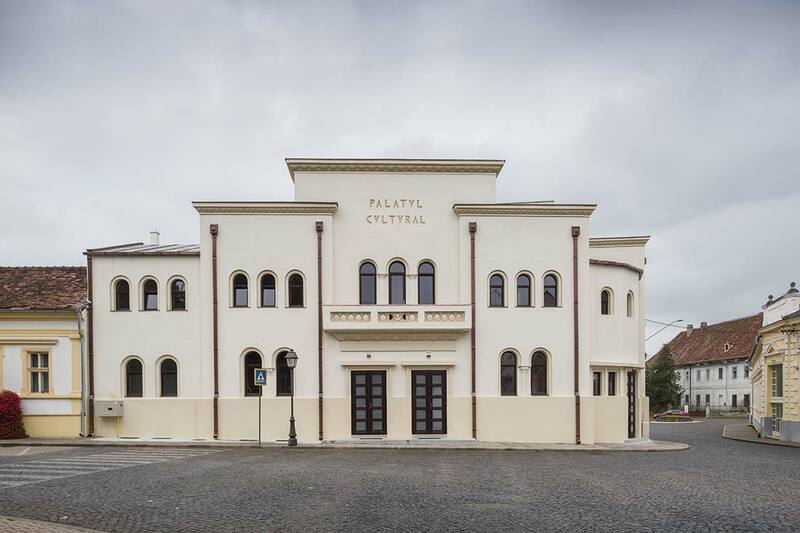 By rehabilitating the ruins of the Cultural Palace, the small community of Blaj (population 21,000) has regained a public heritage building as well as the only multi-cultural facility in the town. Its rehabilitation is also a celebration of architecture sensitive to current urban and functional contexts and to the needs of the public it serves. Besides a rehabilitation of the initial architecture, the projects’ ambition was also to remind the community of the building’s recent, traumatic history. In the Archives, we have found fragments of the original design project, from which we could extract some historical and technical information relating to the realization of the building during the interwar years. Unfortunately, no identified pictures of the interior of the main hall were recovered. With the benefit of historical research and with technical expertise we decided that the spatial and functional design of the ruined building would follow the 1930s original concept. Consequently, the alterations that were made in the 1960s to accommodate the former institutions had to be removed. The new design follows two directions: firstly, to reflect the recent tragic history of the building and secondly, to create a flexible interior and exterior space that can easily be adapted to the needs of the community that it serves. The main hall becomes a multi-purpose space by removing all the seating and through the addition of more daylight through the use of new roof lights. Other reversible changes such as the metal structure of the roof, the exposed brickwork and the suspended ceiling, remind the visitor of the 1995 fire. The budget was a restrictive 2 million Euros. 70% of this budget was committed to the cost of structural reinforcement and consequently the choice of technical and finishing solutions had to be innovative and economically effective. This has resulted in preserving the integrity of the ruin’s brick walls whilst incorporating modern sympathetic materials in the ceilings and doors. The project proposed reversible solutions that did not affect the remainder of the existing building. Thus, all the structural elements of the new roof are independent of the structure of the existing walls. All concrete reinforcements are made hidden, without affecting the original image. All the reconstructed elements of the brickworks was done using matching, reclaimed site bricks. Also, one of the main concepts of the project was to identify appropriate, sustainable materials that were sympathetic to the building. Thus copper was used extensively in roofing, gutters and downspouts; organic plaster for the facades and interior; exposed brick walls for the auditorium and ceiling and interior joinery of Cor-Ten steel.